We’ve just pushed version 1.5.0 live and it’s a HUGE update! The biggest feature is the new Transformers dashboard. If you’ve ever had problems with content not getting converted properly then Transformers are your answer, allowing you to target specific shortcodes, the_content() filters or individual elements. They’re fairly straight forward but you can checkout this post later on today for a more in-depth overview (we pushed the release early, the documentation won’t be ready until the end of the day). We’ve completely reworked how you control Instant Articles. You’ll notice a new Instant Articles option in the Post Publish box. 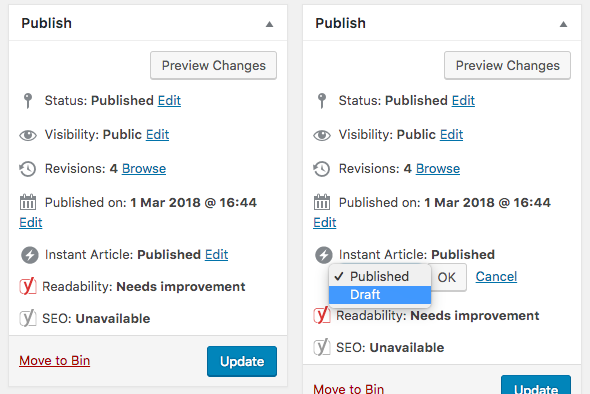 Now if you want to disable the Instant Article version of a post you can use this option to change it to Draft and it won’t get published. Much simpler! You’ll also notice a new Dashboard area (this is going to be developed further in future versions) as well as a What’s New (check it out for a slightly more comprehensive overview of the updates) & Getting Started (aimed at the RSS feed method currently) tabs. We’ve also added in two new Shortcodes for Ads & Related Posts. Other minor features include improvements to the content parser (specifically dd elements and image captions), full support for the Aesop & Zombify page builder plugins, Jannah theme support, fixing an irritating bug with Visual Composer, and making the plugin fully PHP 7.2 compatible. We’ve also improved the Placement Manager and added in Embeds and Ads as available options. Be sure to checkout the Readme for a complete list of fixes, and as ever, if there any bugs or issues please let us know! Don’t forget to Like and Follow us on Facebook and Twitter to keep up with everything we’re doing. Enter your email address to sign up to our newsletter, subscribe to our blog and receive regular product updates.